Beer judges are the true ambassadors for beer and they encourage dialogue about beer styles and the pursuit to strive for the best flavors possible. Without beer judges, marketing techniques play too big of a role in what is considered to be “good tasting” in the beer world. 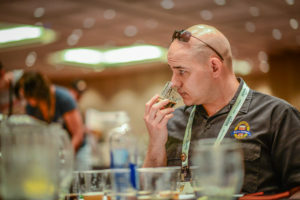 The Beer Judge Certification Program (BJCP) is a nonprofit entity that not only certifies beer judges, but they also maintain beer, mead and cider style guidelines that are used by home brewers and professionals around the world. 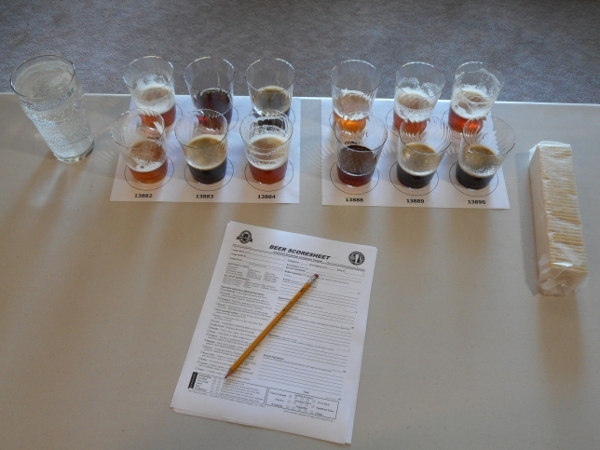 Firmly believing that beer judges play a big role in cultivating and maintaining great beer flavor, I wanted to learn what it takes to become a judge and how the BJCP works, so I contacted the Beer Judge Certification Program. Shortly after contacting them, I was kindly granted an interview with Communications Director Dennis Mitchell who is also an Associate Exam Director, holds a rank of Grand Master and has a Mead Judge endorsement. From the interview I learned that it actually does not cost very much to become a certified beer judge and that the process is pretty straight forward assuming your main senses are intact and you know your beer styles per the BJCP guidelines. At the time of this writing the online entrance exam costs $10.00 per attempt and the practical judging exam once you pass the entrance exam cost $40.00 for the first attempt and $15.00 for each retake. The judging exam consists of properly identifying 6 samples that can be nearly anything from the style guidelines. If or once you score an 80% or higher on your tasting exam you can take a written exam to gain the rank of National or Master and the fee is $25. Obviously if you have to retake a lot of tests the cost can be prohibitive, thus you should study well beforehand. Rank in the BJCP can range from Apprentice for those that did not pass the judging exam all the way to Grand Master, for those with high exam scores and many judging experience points. Ranks in between include, in order: Recognized, Certified, National and Master. Higher exam scores and more judging experience are needed to reach each higher rank. It should also be noted that you receive experience points for participating in BJCP events and those points weigh heavily on your acquired rank. In other words, you do not receive a high rank by testing well alone; you actually have to be part of the staff, organize or judge at BJCP events and get experience points for your participation in order to receive a rank other than Recognized. The BJCP does offer training material, but does not really train you to become a beer judge; you have to do that on your own. It is true, however; that many local judges and homebrew clubs that are about to host exams offer training and education content to help prepare you for the exam. In reality though, it is up to you to obtain and try samples of different styles of beer, hopefully sourced from local home brewers, and to purchase off flavor kits to add to beer so that you can learn how to identify them and thus judge beer. You will also need a background in brewing techniques and troubleshooting, therefore you might find it helpful to help a friend that brews beer or to start home brewing yourself if you do not do so all ready. Being curious, I asked Dennis how the BJCP creates the style guidelines in general and how they come up with a new style of beer to add to their guidelines. Dennis, wanting to get me the best answer corresponded with Gordon Strong- BJCP President, principle author of the 2015 BJCP Beer Style Guidelines and Grand Master X Judge and then forwarded Gordon’s answers to me. There is always a problem with defining styles that have a long history since they change so much over time. Stouts and porters may have started out as something similar, but they eventually took on new meanings as brewers created individual variations. For instance, many breweries make an Oatmeal Stout but how many make Oatmeal Porter? For purposes of the guidelines, we try to make a good faith effort to define styles in a way that creates some “space” between styles. That is, we don’t want it to be confusing to brewers where to enter their beers, or to have multiple places where a beer could be entered. So this may involve creating some separation and distinction between styles that doesn’t really exist in the marketplace. Rather than trying to categorize all commercial beers within our guidelines (which isn’t one of our goals), we try to find where certain “clusters” of beers exist then define these differences. So it’s all about context. The BJCP style guidelines are not trying to be a reference to all beer styles that ever existed in history; they are designed to be a common communications method between brewers and judges to facilitate competitions. Most experienced beer judges can easily differentiate between generic names for beers and specific beer styles used in competitions. For example, you couldn’t really enter a beer as a “stout” in a competition — it wouldn’t be specific enough. But if you were in a bar and saw a stout listed on a menu, you’d have a pretty good idea of what you were going to get. We don’t want to have an artificial difference between BJCP beer styles and how people talk about beer in general. However, we do need to create specific enough descriptions that they are usable by judges. We do sometimes create arbitrary differences in beer styles, particularly for specialty-type beers. In that case, we aren’t really defining styles as much as we are subdividing entry categories to help competitions manage a large amount of entries. People often confuse beer styles and beer categories in the BJCP style guidelines. A beer style is a specific named description for a type of beer, while a category is a grouping of beer styles for purposes of competition judging. Some people like to assume there is some tight correlation between styles within a category, but that isn’t true. Sometimes we group beers just because they have a similar palate impact and might be easier to judge together, not because they are historically, geographically, or otherwise related. My Second Question: How do you recognize (come up with) a new style? There are several ways this can happen. If it’s something new and popular, there is usually strong demand for it (we get requests from brewers and judges, and we see it entered in competitions) — this is currently the case for New England IPA. The problem is that some styles are just fads and go away almost as quickly as they come about. So we normally like to see some evidence that commercial breweries are making the style, that it’s widely available, and that it is relatively stable (not actively changing definitions). We can also decide to define a style that has been around for a long time but that hasn’t been popular as it once was, or that seems overlooked. Perhaps this could have been due to the fact that it wasn’t from the United States, or that there aren’t imports available to Americans. I think about Gose as an example. We started defining it before it became a popular style currently. We can also decide to clarify styles based on past usage, such as separating styles that had been combined for competition purposes. For example, we divided tropical stout from foreign export stout. One was relatively sweet, while the other was bitter yet they had similar strengths. Other styles might be created as variations or that we decide a style is sufficiently broad that it becomes difficult to judge without additional clarifications. For example, Saison is a very broad style with different color and strength variations. So we added additional descriptors that can allow a judge to better understand the brewer’s intent. So mostly we just stay aware of the marketplace (not just in the US, but worldwide), pay attention to what gets entered in specialty categories in competitions, and see what kinds of questions and requests we get from people asking about the guidelines. These normally tell us that either a new style needs to be created or that existing styles need to be clarified. Whenever there are changes to the guidelines, there is some confusion as to the best place where beers can be entered. So we often add guidance that helps answer these questions. The BJCP from all appearances takes as much care in their style guidelines and in the Beer Judge Certification Program in general as you could possibly ask. It should be pointed out that the Brewers Association has its own beer style guidelines that are used by commercial brewers and by the judges judging beers made by commercial brewers. The interesting thing about the BJCP style guidelines however, is that many professionals in the commercial craft-beer world use the BJCP style guidelines and such an example is the Cicerone® Certification Program. I contacted John Scholl – Marketing Manager at the Cicerone® Certification Program and asked him why. Here is his response: “The Cicerone® Certification Program has selected BJCP as a style guide for all of our training and exam material. We feel that they have quality style guidelines and their standards are known around the world.” To me that speaks volumes as to the credibility of the BJCP. The BJCP has a great influence on the commercial beer world even though it is not their focus. Consider that most commercial brewers start out as home brewers. Before seeking employment at a brewery or starting one on his or her own, the soon to be commercial brewer usually enters homebrew competitions to see how his or her beer stacks up to other home brewers’ beer. Most of the beer judges at AHA and BJCP sanctioned homebrew competitions are certified by the BJCP which would mean that the home brewers that might someday become commercial brewers probably have the BJCP style guidelines etched in their brains. I asked Dennis a few other questions such as, do you differentiate between All-Grain brewers and Extract brewers? The answer to this question was no and for a simple reason. How can the judge know, other than by taste, how a beer was brewed? I would expand further and say, sure there are some good, maybe even great Extract beers out there, but does it not make sense that All-Grain brewers can make a better beer given the control and free realm that they have? In the least, All-Grain brewers can make an original beer that the judges have not tasted a thousand times before. I also asked Dennis if he could taste the difference between a bottled verses a draught beer. He did not give a yes or no answer, instead he pointed out that beer taste has more to do with freshness and not the vessel it was served from. As he explained it, you can have a bottle of beer that is outstanding tasting when compared to a draught version of the same beer simply because the draught beer has been sitting in the line, un-purged for a long period of time whereas the bottle of beer is freshly poured. Flavor, he says, varies more on the handling of the beer than it does whether it was pulled from a tap or poured from a bottle. I wondered how the BJCP keeps judges from going rogue so I asked Dennis and he informed me that it is standard for homebrew competitions to have two judges which helps to keep things on track. An example he gave is that one of the judges might be coming down with a cold and does not realize it is affecting his judging skills. The scores from the second judge help keep things in balance. He also mentioned that during the tasting exams, the exam is overseen by an exam director who works with a local exam administrator and together they ensure that the beer being tasted falls within the parameters. This helps to keep all of the judges calibrated if you will.